Temporary fix for activated=true bug. This is the first public test of the SimpleRockets 2 port of my popular Overload mod for SimplePlanes. 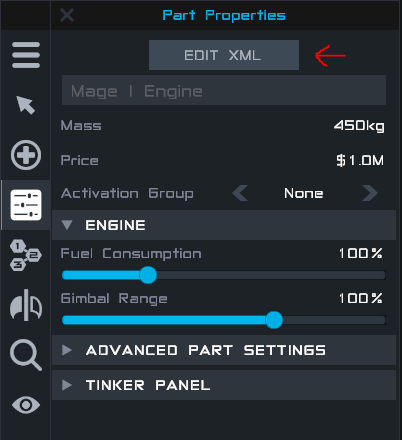 It allows you to edit all aspects of parts in much more detail than the options panel. If you want to know about the full extent of what you can do, I've documented it all, here. It still needs some filling in with explanations but all the options are listed. Find your SimpleRockets 2 save directory. First go to your AppData, then LocalLow\SimpleRockets 2\. However you MUST change username to your username, in lower case. This must be exact for the mod to load for some reason. But, you MUST replace [MOD PATH LOWERCASE] with the absolute path to the mod file (in the mods folder), in lowercase. This is for some reason essential for the mod to load. Then you can simply click this to edit the selected part! The input caret disappears when scrolling. Text disappears when you scroll too far down. Another InputField bug. For now, use the arrow keys to scroll down. Any other bugs please mention. @JediWolf yeah, android should support modding, but like SimplePlanes, iOS will not due to Apple's App Store policies. @WNP78 when mobile comes in a few months or something like that how will you plan on a mobile port? When I eventually get a computer. @Opise227 the open/close tag thing is simply how XML works. Because <EnabledMods /> is "self-closing", it is essentially shorthand for <EnabledMods></EnabledMods>. The lower case thing is a nuance of the game. The mod loading wasn't really designed to be doing this at this point. It gets all the mods it can see, including the details on path and last updated, and checks for an exact match in the settings file. Before it does this it converts the other path to lower case (probably to negate any changes in case), so the entry in settings has to be lower case as well. I have tested this. It will be more user friendly in the future when the mod api is officially supported. @Opise227 The problem is that the path needs to be all lowercase letters. Change all of the uppercase letters in the path to lowercase and you should be fine. It gave me an interesting... problem? But isn't that just weird that instead of putting the line of code inside of <EnabledMods />, we have to change it for an open/close tag? however nobody seemed to have problems. Second thing is the lowercase. I mean, why would you do this in the first place? Wouldn't the file read it differently? Nobody seems to have issues with that and you Specifically said that it had to be in lowercase. As I was thinking of that, I tried to save another set of settings and expected to see the XML file to remove the line. But instead, it correctly capitalized by itself the path! Still, the button doesn't show up. Very amaze, much wow, such impress! @SupremeDorian Just checked, this is indeed a bug and I think it's a problem with the input fields again. For now, use the arrow keys to move the cursor down. @AxelSpace see step 5 - find the line that says <EnabledMods /> and replace it with the text below, then replace /path/to/mod with the full path to the mod in lower case. @WNP78 - I prefer the term "CDO". It's like OCD, but the letters are in alphabetical order. @swope yes, you will go down in history. Your great sacrifice in the name of OCD will be remembered. At least I still have my first comment on this.